The idea behind Songs of Hope™ is a simple one, really. To understand a culture, meet its people. Listen. Talk. Live together. Sing a song together. Play a game. Share. Songs of Hope™ unites children and adults from countries and cultures worldwide. Our purpose is to create opportunities for cultural sharing through daily camp life, in rehearsals, and on stage. Songs of Hope™ is a non-profit project with an emphasis not only on learning, but also on service to others. 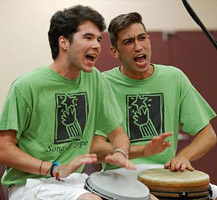 Our award-winning Songs of Hope™ concert tours celebrate cultures and promote global thinking. The Songs of Hope™ project begins each summer with a carefully planned orientation that makes every child feel safe. Knowing they're in a safe, caring environment, Hopers™ are able to share, to learn together, to take risks, and to grow. Songs of Hope™ really and truly creates an international "family." As you explore this web site, you will get the sense of family everywhere – in the video segments, in the photographs, and in the kids' testimonials. Songs of Hope™ offers all the benefits that come with artistic creation: discipline, focus, teamwork, creativity, sense of purpose, sense of accomplishment, confidence, and community. When you first come to Songs of Hope™, you find yourself living with kids from other countries. Most of them will be newcomers like you, but one of your roommates will also be a ComeBack Kid, a returnee from previous projects. Your roommates and you will become friends, guaranteed. All the experienced Junior Team members live with you in the same dorm, sharing daily living, helping in rehearsals and activities, leading free time fun, and being mentors and true friends.